When any of these DTCs is stored, the ECM enters fail-safe mode. The ECM turns off the air fuel ratio sensor heater in fail-safe mode. Fail-safe mode continues until the ignition switch is turned off. The ECM provides a pulse width modulated control circuit to adjust the current through the heater. 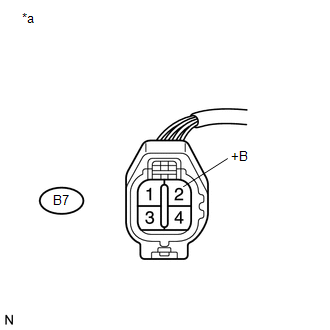 The air fuel ratio sensor heater circuit uses a relay on the +B side of the circuit. Air fuel ratio sensor heater current is less than 0.8 A, even when the air fuel ratio sensor heater duty cycle is 30% or higher (1 trip detection logic). Air fuel ratio sensor heater current reaches the high limit (1 trip detection logic). The heater current is higher than the specified value while the heater is not operating (1 trip detection logic). The ECM uses information from the air fuel ratio sensor to regulate the air fuel ratio and keep it close to the stoichiometric level. This maximizes the ability of the three-way catalytic converter to purify the exhaust gases. The air fuel ratio sensor detects oxygen levels in the exhaust gas and transmits the information to the ECM. The inner surface of the sensor element is exposed to the outside air. The outer surface of the sensor element is exposed to the exhaust gas. The sensor element is made of platinum-coated zirconia and includes an integrated heating element. The zirconia element generates a small voltage when there is a large difference in the oxygen concentrations between the exhaust gas and outside air. The platinum coating amplifies this voltage generation. The air fuel ratio sensor is more efficient when heated. When the exhaust gas temperature is low, the sensor cannot generate useful voltage signals without supplementary heating. The ECM regulates the supplementary heating using a duty-cycle approach to adjust the average current in the sensor heater element. If the heater current is outside the normal range, the signal transmitted by the air fuel ratio sensor becomes inaccurate. As a result, the ECM is unable to regulate the air fuel ratio properly. 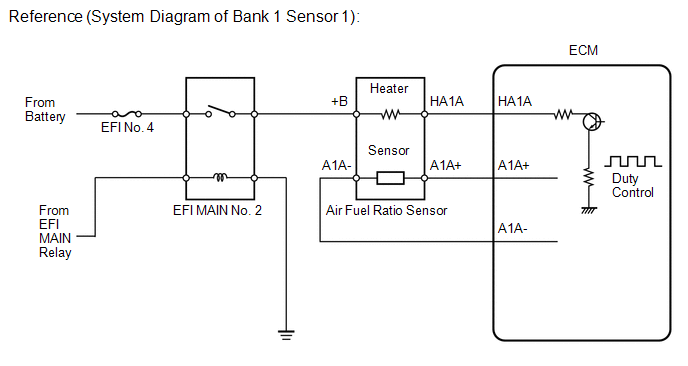 When the current in the air fuel ratio sensor heater is outside the normal operating range, the ECM interprets this as a malfunction in the sensor heater and stores a DTC. Start the engine and idle it for 5 minutes or more [B]. With the vehicle stationary, depress the accelerator pedal and maintain an engine speed of 3000 rpm for 1 minute [C]. 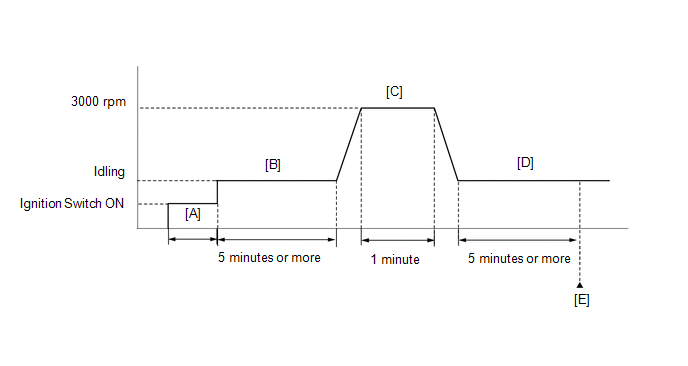 Idle the engine for 5 minutes or more [D]. Input the DTC: P0031, P0032, or P101D. If the judgment result shows INCOMPLETE or N/A, perform steps [B] through [E] again. output voltage does not change (almost no reaction) while performing the Active Test, the sensor may be malfunctioning. (a) Inspect the air fuel ratio sensor (See page ). (f) Allow the vehicle to drive in accordance with the driving pattern described in the Confirmation Driving Pattern. (a) Inspect the EFI MAIN No. 2 relay (See page ). (b) Remove the engine room junction block assembly from the engine room relay block.